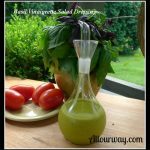 A tangy tasting salad dressing that gives your greens a fresh appeal while imparting a beautiful celadon tint to your vegetables. A wonderful way to use up the extra basil leaves. Add everything except olive oil to a blender and puree. Slowly add the olive oil to the basil mixture so it will emulsify and blend thoroughly. You can use red wine vinegar in place of the white balsamic but we found it a bit acidic and had to add a teaspoon of honey. The white balsamic is the perfect blend for us -- just a touch of sweetness and less acidic.